Are your DNS nameservers impeding your Internet experience? A unique, comprehensive, accurate & free Windows (and Linux/Wine) utility to determine the exact performance of local and remote DNS nameservers . . .
Now you CAN measure it! Click here or on the image above to download this 147 KByte program. Click the “Nameservers” tab to select the main benchmark display and data pages. Click the “Run Benchmark” button (it may take a moment to become enabled). Click and read the “Conclusions” tab after the benchmark completes. Unless you're a super-guru, PLEASE really do read the “Conclusions” tab once the benchmark has completed. Some people have initially been overwhelmed and intimidated by this benchmark's deep and rich feature set, and by the amount of specific detail it generates. They haven't known what it meant or what, if anything, they should do about it. But you will discover that the “Conclusions” tab presents a distillation of all that, into a set of carefully worded . . . er . . . Conclusions. Really. unique features of GRC's DNS Benchmark utility are provided below. People use alphabetic domain names (www.grc.com), but Internet data packets require numerical Internet IP addresses (4.79.142.202). So the first step required before anything can be done on the Internet is to lookup the site's or service's domain name to determine its associated Internet IP address. Since nothing can happen until IP addresses are known, the use of slow, overloaded or unreliable DNS servers will get in the way, noticeably slowing down virtually all of your use of the Internet. Unless you have taken over manual control of the DNS servers your system is using (which, as you'll see, is not difficult to do), your system will be using the DNS servers that were automatically assigned by your Internet connection provider (your ISP). Since they are likely located close to you on the Internet (since they are provided by your own ISP) they may already be the fastest DNS servers available to you. But they might be in the wrong order (the second one being faster than the first one, and that matters) or, who knows? Many people have discovered that their own ISP's DNS servers are slower than other publicly available alternatives on the Internet, which are faster and/or more reliable. This DNS Benchmark will give you visibility into what's going on with your system's currently assigned DNS servers by automatically comparing their performance with many well known publicly available alternatives. 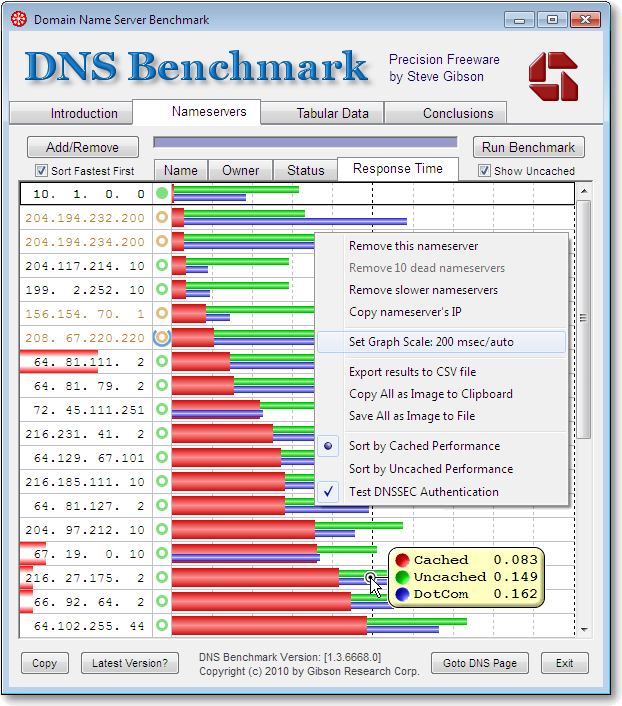 What is GRC's DNS Benchmark? GRC's DNS Benchmark performs a detailed analysis and comparison of the operational performance and reliability of any set of up to 200 DNS nameservers (sometimes also called resolvers) at once. When the Benchmark is started in its default configuration, it identifies all DNS nameservers the user's system is currently configured to use and adds them to its built-in list of publicly available “alternative” nameservers. Each DNS nameserver in the benchmark list is carefully “characterized” to determine its suitability — to you — for your use as a DNS resolver. This characterization includes testing each nameserver for its “redirection” behavior: whether it returns an error for a bad domain request, or redirects a user's web browser to a commercial marketing-oriented page. While such behavior may be acceptable to some users, others may find this objectionable. The point made above about the suitability — to you — of candidate nameservers is a crucial one, since everything is about where you are located relative to the nameservers being tested. You might see someone talking about how fast some specific DNS nameservers are for them, but unless you share their location there's absolutely no guarantee that the same nameservers would perform as well for you. ONLY by benchmarking DNS resolvers from your own location, as this DNS Benchmark does, can you compare nameserver performance where it matters . . . right where you're computer is. When the benchmark is run, the performance and apparent reliability of the DNS nameservers the system is currently using, plus all of the working nameservers on the Benchmark's built-in list of alternative nameservers are compared with each other. Results are continuously displayed and updated while the benchmark is underway, with a dynamically sorted and scaled bar chart, and a tabular chart display showing the cached, uncached and “dotcom” DNS lookup performance of each nameserver. These values are determined by carefully querying each nameserver for the IP addresses of the top 50 most popular domain names on the Internet and also by querying for nonexistent domains. Once the benchmark finishes, the results are heuristically and statistically analyzed to present a comprehensive yet simplified and understandable English-language summary of all important findings and conclusions. Based upon these results, users may choose to change the usage order of their system's own resolvers, or, if alternative public nameservers offer superior performance or features compared with the nameservers currently being used, to switch to one or more alternative nameservers. Compatible with all versions of Windows from Windows 95 through Windows 7. Compatible with Wine (Windows emulation) running on Linux and Macintosh. Hand-coded in 100% pure assembly language for highest precision and smallest size: 147 KBytes. Installation-free — nothing to install — just run the small executable file. Lightweight (single packet), optional automatic and/or manual version checking. Task Scheduler-compatible for non-UI non-interactive background operation. Optional, automatic results logging for fully unattended operation. Comprehensive error return codes to support full automation. Cached lookups – the time to return a domain name that is already in the resolver's name cache. Uncached lookups – the time to return a sub-domain name that is not already in the resolver's name cache. Dotcom lookups – the time to consult the nameserver's chosen dotcom resolver(s) for a dotcom name. Reliability – the number of queries not replied to (lost) during the benchmark. Rebinding protection – whether the resolver blocks non-routable private IP addresses. Optionally verifies whether nameservers provide DNS security (DNSSEC) record authentication. When using a list of (provided) DNSSEC-signed domains, benchmarks DNSSEC authentication performance. Graphs and compares all four benchmark parameters with an easy-to-read bar chart. Builds a customized list of the fastest performing (for you) top 50 resolvers, located anywhere in the world, selected from a master list of more than 4,800 possible known resolvers. On-the-fly hierarchical sorting of performance results by cached (default) or uncached performance. Auto-scaled bar chart that can be manually overridden for chart-to-chart comparison. Pop-up value “inspector” (left click in nameserver list) displays precise values on bar chart. Fully detailed, locale-aware (internationalized), CSV results export. Automatic logging to a CSV file for long-term background results monitoring and collection. Simultaneously compares the performance and reliability of up to 200 DNS nameservers. Determines network name (reverse DNS), ownership, and operational status for each nameserver. Determines whether nameservers intercept and redirect bad domain names. Comprehensive, heuristic “Conclusions” generation summarizes all results and suggests useful system changes, if any, in easily readable English. All results are analyzed for statistical significance with a 95% confidence threshold. Bottom of tabular data page contains built-in quick-reference “reminder” help. The built-in top-50 domains list is user-replaceable to allow more/less statistical significance, and for support of DNSSEC record authentication. .INI files containing sets and subsets of nameservers to benchmark can be added, removed, and saved. Special “dnsbench.ini” file is auto-loaded, if present, to always override built-in nameserver list. At start-up, tests for the presence of, and deliberately “triggers”, any outbound-blocking personal firewalls to allow Internet access exceptions to be provided before testing begins. Internet connectivity aware – verifies unimpeded Internet connectivity before testing and gracefully handles possible loss of Internet connectivity during testing. Bar chart results can be copied to the system clipboard or saved in BMP or compressed PNG format for storage or sharing. Built-in self-screen capture to BMP or compressed PNG file. All benchmark pages and tabs can be copied to the system clipboard or saved to files as text, rich-text, or images as appropriate. The best way to familiarize yourself with the DNS Benchmark's operation is to download a copy to your computer. Note that it's not very large (only 147 KB) so it won't take long. And also note that there's nothing to “install” — you just run the executable file. So fire it up and poke around at its many features. The “Features / Operations Walkthrough” page provides a visual quick-reference guide to the program. You are invited to refer to that page while exploring the program, or check-out the Features / Operations Walkthrough page first.